American Range Villa serie 36" professional Warming Drawer with intergrated drawer panel plate for attachement to your kitchen cabinet face. Featuring one touch presets, adjustable temperatures and on-times. With Automatic shut-off at end of cycle and easy to read digital display of time and temperature that simplifies programming. This model requires a locally supplied custom door. 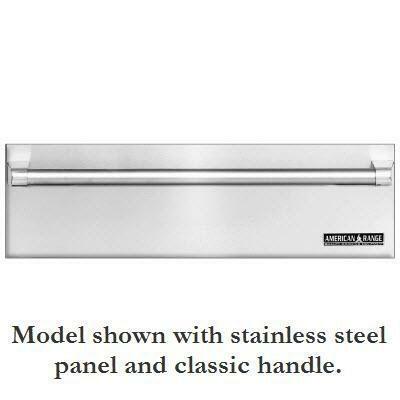 Additional Information Intergrated drawer panel plate for attachement to your kitchen cabinet face; One-touch controls presets, adjustable drawer temperatures and on-times; Easy-to-read digital display of time and temperature simplifies programming; Automatic shut-off at end of cycle helps save energy; Sabbath mode for up to 84 hours of hands-free operation; Four radiant heaters take the drawer from 70ºF to 140ºF in 4 minutes and to 90ºF in 9 minutes; Four infrared heaters & two convection fans standard in all models; Two convection fans hold the drawer at a uniform temperature to +/- 1ºF accuracy; Three-slides on the drawer for increased stability; This model requires a locally supplied custom door.